Dean Koontz is at the peak of his acclaimed powers with this major new novel. A young boy, a musical prodigy, discovering life's wonders--and mortal dangers. His best friend, also a gifted musician, who will share his journey into destiny. His remarkable family, tested by the extremes of evil and bound by the depths of love . . . on a collision course with a band of killers about to unleash anarchy. And two unlikely allies, an everyday hero tempered by the past and a woman of mystery who holds the key to the future. These are the people of "The City, " a place where enchantment and malice entwine, courage and honor are found in the most unexpected quarters, and the way forward lies buried deep inside the heart. Brilliantly illumined by magic dark and light, their unforgettable story is a riveting, soul-stirring saga that speaks to everyone, a major milestone in the celebrated career of #1 "New York Times" bestselling author Dean Koontz and a dazzling realization of the evergreen dreams we all share. "Beautifully crafted and poignant . . . "The City" is many things: serious, lighthearted, nostalgic, courageous, scary, and mysterious. . . . It] will have readers staying up late at night."" --New York Journal of Books"
" Koontz] can flat-out write. . . . The message of hope and depiction of how the choices you make can change your life ring true and will remain with you once the book has been closed." --"Bookreporter"
"Perhaps more than any other author, Koontz writes fiction perfectly suited to the mood of America: novels that acknowledge the reality and tenacity of evil but also the power of good . . . that entertain vastly as they uplift." --"Publishers Weekly"
"A rarity among bestselling writers, Koontz continues to pursue new ways of telling stories, never content with repeating himself."" --Chicago Sun-Times"
"Tumbling, hallucinogenic prose. 'Serious' writers . . . might do well to examine his technique."" --The New York Times Book Review"
" Koontz] has always had near-Dickensian powers of description, and an ability to yank us from one page to the next that few novelists can match."" 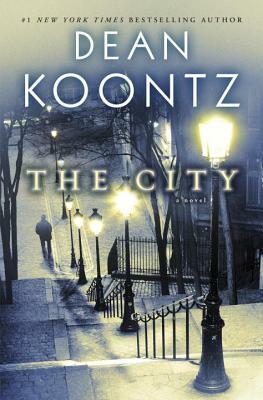 --Los Angeles Times"
"Koontz is a superb plotter and wordsmith. He chronicles the hopes and fears of our time in broad strokes and fine detail, using popular fiction to explore the human condition."" --USA Today"
"Characters and the search for meaning, exquisitely crafted, are the soul of Koontz's] work. . . . One of the master storytellers of this or any age."" --The Tampa Tribune"
Dean Koontz, the author of many #1" New York Times "bestsellers, lives in Southern California with his wife, Gerda, their golden retriever, Anna, and the enduring spirit of their golden, Trixie.